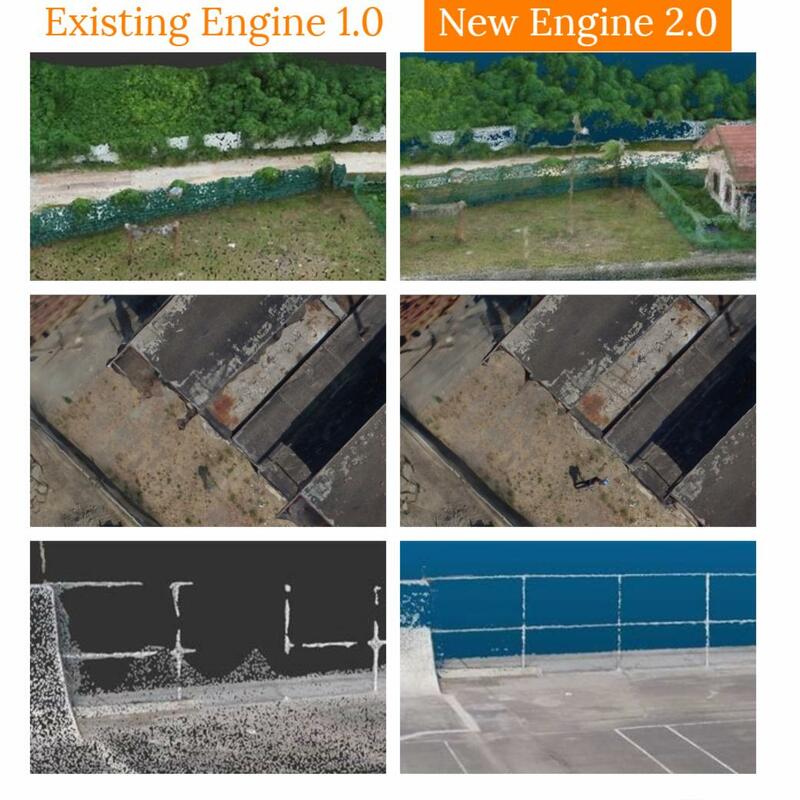 Updates were made the reality capture API on Forge that not only dramatically improves the resulting quality and speed to produce a mesh or view point clouds, but also adds geolocation for InfraWorks. For example you can use this Forge API to generate a 3D textured mesh from photos taken buy a UAS (drone). Edges of roofs and sides of building structures are preserved during reconstruction. Small parts like structural beams and pipes are preserved in the point cloud. This will greatly improve the quality of point clouds with a lot of thin parts e.g. pipes in oil refinery factory, structural steel posts and beams, fencing, etc..
Coverage and accuracy of the point cloud is much more accurate. Reference benchmarks below. Meshing engine: A brand new meshing engine resulting in better quality and faster / parallel mesh creation. It is also primed for handling much larger datasets in the future. More complete mesh model. Reconstructed scenes usually come with missing areas from occlusions / texture-less surfaces / missing photo from certain view, etc. The new meshing engine is able to fully utilize accurate position and normal information from new multi-view stereo engine to complete missing areas. Edges of roofs and buildings are clearer and more accurate. Thin parts are more accurate on ortho images as there is less re-projection errors thanks to the more accurate 3d models. Mesh models (OBJ & FBX) are automatically geolocated when imported into InfraWorks®.